Few words conjure up as many feelings of dread and doom as the word homework does for school-aged children. Many view homework as a daunting task that keeps them from playing outside, hanging out with friends, or watching Netflix. Tales of miserable homework experiences are as timeless as scraped knees and broken hearts. We all have our horror stories of forgotten assignments, incomplete homework, and unforgiving teachers – the ones who gave you an F, despite your incredibly valid excuse. I teach high school, and I was recently swapping stories with my own parents, both former educators, about homework excuses. Years ago, when my mother was teaching seventh-grade English, one of her students presented the most famous excuse of all time for not having his homework assignment. “He told me his dog ate it,” my mother said. “Then, he reached into his book bag and pulled out a tattered worksheet. Sure enough, it was a little slobbery, and it had bite marks.” My mother was nearly positive he was telling the truth, so she allowed him to make up the assignment. Among our family of teachers, we have pretty much heard all possible homework excuses: I forgot my notebook. I was absent that day. I left it in my dad’s car. I couldn’t find the page it was on. My computer crashed. There was a death in the family. My printer ran out of ink. I was sick. I had to work. It was stolen. It got wet. I lost my flash drive. In my twelve years of teaching, I have sifted through these excuses, some more plausible than others, and stood next to students while they rummaged through backpacks for homework assignments we both knew did not exist. The root of the matter is that homework is disliked by nearly everyone, including parents. And working on homework assignments and inventing excuses for not completing them have become a true family affair. Though I have been assigning homework for more than a decade, I am really just discovering the true nature of this homework animal as a parent. My child is a second grader this year, and he has had homework since he began kindergarten. After asking my son about his day and trying to talk about highs and lows, next comes, “What do you need to do for tomorrow?” He can usually tell me if he has a story to read, worksheets to complete, or spelling words to study. We check his planner and confirm the details of the assignment, then he gets to work. He starts off enthusiastically, then we fall into the same pattern of complaints about the assignment and what he would rather be doing. We contend with the distractions of his noisy younger sister, squirrels on the patio, and his insatiable hunger. 1. It is essential to be well-equipped with many of the same supplies your child uses at school. Homework at the elementary level often requires coloring, cutting, and glue-sticking. Purchase extra crayons, glue, and scissors, in addition to pencils and paper. And be sure to buy the type of paper your child uses at school in order to practice handwriting with consistency. Keep all homework supplies together in an easily accessible location so finding the supplies doesn’t add to the stress of homework completion. 2. Provide a homework environment that is free from distractions. It is already difficult for young children to concentrate on homework after a full day of school. They need to be away from all electronics and noisy siblings. It is also helpful to have a clean desk or table and to designate that area as the homework spot for the entire school year. 3. Create additional structure by setting a timer for each worksheet or individual task. This is especially helpful for a child who is prone to piddling or daydreaming. 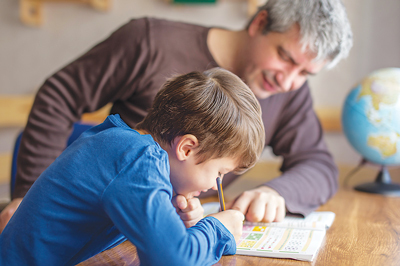 The timer can help keep him on task and make completing homework feel a little like a game. You can also provide a small reward as an extra incentive. 4. Include a few breaks throughout the homework session. Three or four worksheets can feel like a lot for a young child. Give him several stretching breaks or a midpoint snack break. Students in elementary school get out of their seats frequently throughout the day, so it’s unrealistic for them to sit for long periods at home without a break. 5. Read books with your child each evening, whether reading is assigned or not. Let your child see you enjoy a book from time to time, as well. It is important to model the skills and behaviors we want our children to develop. At this young age, my husband and I are helping our second grader with homework by clarifying directions and providing examples, if he needs them. We do not do the assignment for him, and we do not correct the errors he makes on his worksheets. The only exception to our rule is if he has done the entire assignment incorrectly. Then, we explain it again, in a different way, and have him redo it. 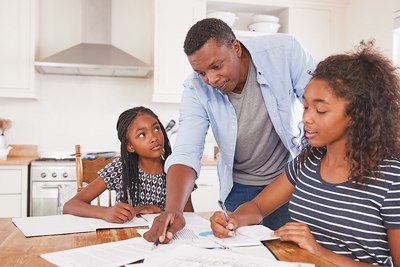 As a parent, it is difficult to look over your child’s assignment and not fix mistakes when you see them, but it is an important step in raising an independent student. Teaching a child to be accountable for his own schoolwork is essential, and it should be a gradual process that begins in the early grades. It is crucial to remember that you are not helping your child in the long run by completing or correcting assignments for him. Furthermore, it is unrealistic to provide a great deal of help once your child is in middle or high school and subjects become more difficult. Plus, it is simply not your job to do your high school student’s economics, world language, or algebra homework. that I won’t do those things. Parents have a visceral need to help their children. And there are many ways to help students at the middle and high school levels without auditing a college algebra course so you can combine like terms and practice completing square roots with him after dinner each night. There are many resources available for older students, and it’s our job to make sure our kids are using them and not depending on us to do their work. 1. For starters, there is no substitute for being in class and hearing a lecture or participating in a discussion. It sounds obvious, but school attendance is essential for academic success, and chronic absenteeism is a problem in many Virginia school systems. Missing school for illness is unavoidable at times, but if your child says, “It’s no big deal if I miss; we aren’t doing anything in class anyway,” you need to dig deeper. It’s either an excuse to avoid something or a symptom of a much bigger problem that should be addressed with school administration. 2. Organization plays a major role in school success. Encourage your child to write down deadlines and assignments in a daily planner (many schools provide them), or keep track of them electronically – or both, if it helps. It doesn’t matter what system your child uses, as long as it works for him. 3. Encourage your child to communicate with his teacher(s) when he is having difficulty with a concept or doesn’t understand an assignment. By high school, students should be able to approach teachers and advocate for themselves. I have received emails from parents letting me know that “Johnny is not prepared for his reading quiz because he didn’t understand the pages of Beowulf he was supposed to read.” While there are many things wrong with this particular scenario, the most concerning is that the student was unable to tell me himself that he was having difficulty comprehending the passage. At the high school level, most of the communication should be taking place between the student and the teacher. 4. If your child missed class or has questions about an assignment, make sure he is using the resources available to him before you become involved. Many secondary teachers maintain websites with links to assignments, and some even post lecture notes and videos for students to review in the event of an absence. 5. Keep tabs on what your child is doing when he is supposed to be studying or working on an assignment. Remember, I teach high school students. Parents have told me, “I don’t understand why Susan didn’t finish her paper. She was up until midnight.” Susan may very well have been up until midnight, but she also may have been Snapchatting with friends or adding to her Instagram story instead of writing her paper. 6. If your student is struggling, consider a tutor. In addition to hiring adult tutors, investigate peer tutors. Peer tutoring is a wonderful option because besides the affordability factor (peer tutoring is usually free), students are often more comfortable around their peers, and they relate to each other better. It can also be helpful for your child to see for himself that other children their age understand the content. Many schools offer peer tutoring through Beta Club or National Honor Society. Check with the school counseling office to learn more about peer tutoring options. 7. Demonstrate a positive attitude about education. As much as you might want to relate to your child, these are not the years to share stories with your child about the times you skipped school, cut class, or barely passed sophomore English with a D-minus. Reveal those details after your child graduates from high school. A new school year is the ideal time to adjust habits and routines that will point children down a path toward educational success. Our job as parents is to provide our children with supplies, space, time, and fuel to complete their assignments. Then, we need to step back and watch the child do the work. Perhaps parenting is one of the few things that can be accurately compared to rocket science. We have given them equipment and snacks, and now the countdown to liftoff has begun. The rest is up to them. It’s time for us to head to the viewing area and watch the launch.